I've already shared my experience with finding the illegal knock-off of the Shopsmith Biscuit Joiner in the Total Shop catalog, but the astute reader might have wondered how I got their catalog in the first place. I'll admit that I've had a fascination with the Shopsmith clones ever since I first saw an ad for the WoodMaster. I started ordering catalogs and cutting out and saving their ads along with the other clones that followed. In 1987 I went to work for "The Real Thing" as I was fortunate enough to live just outside of Dayton, Ohio where Shopsmith Inc. was based. It was then that my interest in the clones changed a bit. Now they weren't a just a curiosity; they were my competition. I stepped-up my catalog requests because I knew they were all small companies and cleansed their mailing lists frequently. I grilled any customer that visited our store and admitted that they owned one of the clones, and though I didn't totally agree with Shopsmith's "Never sell an item that you know the customer will be attached to a clone" policy, I enforced it and boy did those Total Shop owners bellyache! It was outrageously heavy. Several of the parts which were made of precision die-cast aluminum on the Shopsmith tools were copied in sand-cast iron. Lots of rough edges, and much thicker and heavier than necessary. It was rough and poorly finished. Any tool that comes with a little can of touch-up paint is going to have cosmetic problems. It didn't look like the boogie man that everyone at Shopsmith had made it out to be. Sure, it wasn't close to Shopsmith quality, but I came to the conclusion that day that if the price was right I wouldn't mind having on of these in my Shopsmith collection. Around 1998 I was on my way from Atalanta to Washington DC, and realized that I would be passing by Greenville SC, home town of Total Shop, so after a few minutes on the phone with the folks at 411 I got the address to their showroom. Imagine my surprise when I got there and their doors were locked and through the glass doors I could see that their showroom was clearly being dismantled. Total Shop was gone from the face of the earth. Fast forward to two weeks ago where I was updating this blog with Clone ads and for yucks, I searched "Total Shop" on eBay and CraigsList and came across a unit (Shown in photos at right) in SC, just 250 miles from my home. I emailed the owner and got a few questions answered, and on Friday, October 2nd my son "Boy" and I took a drive south. The owner was the third owner of the tool. The first one was a woodworker who started with this tool and later moved on to individual tools. The second owner never used it and moved it from one storage space to another until finally giving it to a church for a yard sale. The gentleman I purchased it from is a farmer who bought it at the church sale used the tool as a bandsaw and a drill press but never used any of the other functions or SPTs. In fact, when I removed the bandsaw and installed the extension table he exclaimed: "I didn't know it did that!" A quick look at the SPTs revealed that the years of moving around and storage took its toll. The rip fence. the miter gauge and pistol grip, The 12" sanding disc, the lathe drive center, and the posts from the bottom of the jointer. More bad news is that the rubber sleeve on the belt sander's drive drum is badly torn, and though the owner had recently replaced the tires on both wheels of the bandsaw, the work of their demise confirmed in my mind that one of the owners had clearly made a common Shopsmith owner boo-boo by coupling a low-speed SPT while the headstock was still set on a high speed. The other bad news is that the ball casters are badly damaged because at some point they obviously started to unthread, and though they were obviously hanging low, they continued to lift this behemoth onto them until their threaded shafts became terminally bent. So that's the bad. Now let's talk good. 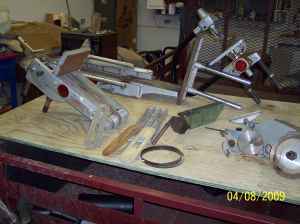 The tool has its upper and lower saw guard, a saw blade and arbor, and molder head, several table inserts, two extension tables, a bolt-on extension for the main table, a 6" Jointer, a 6" Belt Sander, a Jig Saw and a Bandsaw. 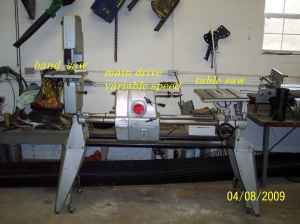 In addition, the deal also included a 36" Vega lathe duplicator and an accessory called a Roto/Carve, which is a weird tool that duplicate carves such things as cabriole legs using a tablesaw! Boy and I disassembled the Total Shop and started loading the car. Man is that sucker heavy! It weighs 94lbs (43kgs) and I made the mistake of lifting it by myself. Now, I mentioned in a previous post that the 6" jointer would be a pain to add and remove from the unit, but I had no idea how true that statement was. And the bandsaw wasn't much better. The body and the cover on the Total Shop bandsaw are sand cast, making them about 25lbs heavier than my Shopsmith bandsaw. What am I going to do with all this? I suspect I'll sell the Vega duplicator and the Roto/Carve and after repairing everything on the Total Shop tools and find replacement parts for all that's missing I'll just possess them. I know, I'm sick.